I was super excited to join Secret Recipe Club this month. I posted on Monday my Potato Bread with Chives for the big reveal. Unfortunately someone didn't post, so there was one lone blogger without anything posted for their blog. Amanda who coordinates the Secret Recipe Club sent out an all call for help! I was happy to step up and be apart of this project! There was so many of us that volunteered Amanda set up a new reveal and here it is! I selected Peanut Butter and Jelly Muffins from Connor's Corner. There were lots of great things to pick from, but I have never made a PB&J anything aside from the sandwich. I have seen bars that peaked my curiosity, so I finally decided to take the plunge when I saw these muffins. Today was the first day of school, and I can't wait for my 6 year old to get home and try his after school snack! Heat oven to 375. Spray muffin pan with no stick spray. Stir together flour, salt and baking powder in a large bowl. Add milk, eggs, sugar, peanut butter and oil to bowl; combine ingredients until just moistened. Do not over beat. Fill prepared muffin cups evenly with half of the batter. Place 2 level teaspoons jam or preserves in the center of each muffin. evenly divide remaining batter between muffin cups. Sprinkle with sugar. Bake for 18-20 minutes. Remove from the oven; cool in pan 5 minutes. I am sure kids would rather see these muffins in their lunch than a sad sandwich, great recipe pic from that site. Thanks for sharing. These are like childhood in a muffin! It was fun coming together and cooking from Connor's Cooking. I hope that you'll check out the Nutella Crêpes which I made from her blog. What a great recipe! How handy to have peanut butter and jelly in a neat little muffin - great for portability. Thanks for the recipe! I am a huge sucker for anything that is PBJ! These muffins seem like the great snack for anytime of day! These look so yummy, I'm sure your son enjoyed this after school treat. Look so good!!! Oh how time is flying so fast all the sudden the school stars already. My son backs to school next week. These are my kind of muffin...anything with PB, I'm in! I saw those on the blog and contemplated making them. They look delicious! MOVE OVER PBJ SANDWICHES!!! THERE'S A NEW FRIEND IN TOWN!!! HAHAHA SO FUN THAT WE ALL POSTED TODAY FOR SRC! Wow these muffins look fabulous! I love anything pb&j! Well done, you :) You're an ace team player and these muffins look fabulous! What a GREAT recipe! I'd love it if you came by Cast Party Wednesday and shared this recipe with us. yummy looking muffins..I love the recipe and that you used pb&j..very creative! These muffins really appeal to me because I love how the filling is in the muffin and you don't need to spread anything on them :) Looks great! There's nothing better than peanut butter and jelly. Well, unless you put them in a muffin. Awesome! What a great combo. I bet everyone loved these! How fabulous! I just found out about this Secret Recipe club, and it sounds like great fun. I love biting into a muffin with secret filling -- this also looks a great base to try all kinds of fruit or chocolate fillings, too. Lovely work! Wow pb & j muffins, love this idea!! They look delicious! I love peanut butter and jelly muffins they are fantastic. I made them not too long ago and they were delicious. I will have to try this recipe out and see what I think of it. These muffins look amazing! Peanut butter and jelly is such a great combo. I've done scones before, but not muffins. PB & J is still my favorite kind of sandwich. I love the idea of it in a muffin. What a great recipe to choose. 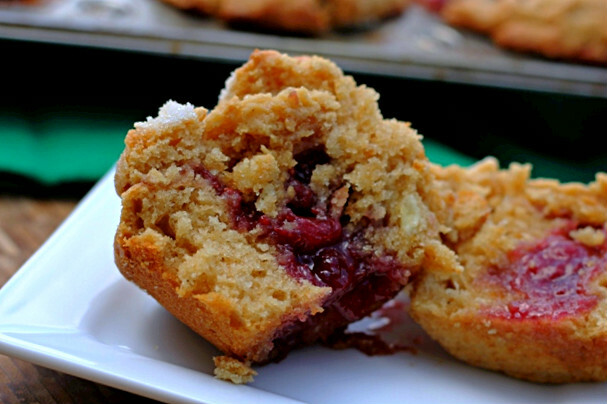 MMmmm, I love PB & J, but in muffin form? I bet these are awesome! yum! what a great muffin! Great SRC choice, these look delicious! What a great recipe! I love new ways to eat PB&J. There is a donut place near me that has PB&J donuts that I love. These muffins look great! Oh my goodness what an awesome choice of recipe! This looks divine!! Yum! These look delicious! I love the idea behind this secret recipe club. Erin, what agreat looking PB & J muffins! Very classic American flavor and I'm sure your son enjoyed it after his first day of school. They are such a great treat. You know how I love muffins! These look so delicious. Great job! Welcome to the SRC and yes the community feel is awesome when someone needs a hand. Very cool PB&J muffins, live it. Wonderful recipe and the SRC is awesome! I love how friendly food bloggers are and always willing to lend hand! 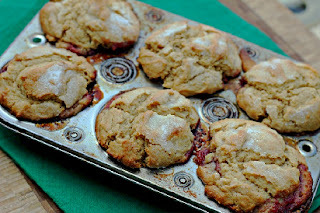 Ive made peanut butter and jelly cookies before but would not have thought of muffins. Good job! This is so simple to make and will do a whole lot of good for someone like me who has just started to bake. These are just pure fun. What a great flavor for a cupcake. Love this combo and glad to be in the club. Ugh! I came over here to talk about my love of muffins and that stupid peanut butter jelly song from one of those TV shows is now blasting through my head..... Sorry, lol. These muffins do sound great! I love anything with peanut butter in it ! Yummm! How lovely that you did this for Raina, I bet she was well pleased to have 32 people cook out of her blog! Your PB&J muffins look really delish! Thanks for taking the time to make a recipe from my blog! Hope your son enjoyed them!! These look so good. Kudos to you for trying something new. I bet your son was happy. These would be a hit with my son and he's 23. lol! Great job. I made these over the weekend for my family and they were a BIG hit. Looks like I'll be making some more since they were requested for school lunches too. You mentioned freezing muffins so you had them ready to go.....How do you package them up for the freezer? Trying to decide what would be best. @Monica - I just allow the muffins to cool completely. Then I store them in a freezer safe zip lock storage bag. They last for a couple months. Microwave for about 25 seconds and it is goo to go! So glad your family liked them!